This episode starts off with Rousseau emerging from the jungle with a message that the Others are coming. She warns that their arrival will be marked with a column of black smoke from a fire in the distance. Jack decides to go to the Black Rock with Rousseau to get some dynamite to blow the hatch door open, so that they can get everyone in there before the Others show up. While Sawyer is in the jungle chopping bamboo, Jack meets up with him to give him a gun and to say goodbye. Before he leaves, Sawyer tells him about his encounter with Christian while he was in Australia, in my opinion one of the best scenes in the entire show. Charlie collects messages from everyone to put in a bottle, and Jack heads off with Rousseau, Locke, Kate, Hurley, and the dynamite expert, Dr. Arzt. Before they get to the Black Rock, they have a run in with the Smoke Monster. Walt asks Shannon to take care of Vincent, Sayid shows Michael how to use the radar to try and spot a ship, and in another one of my personal favorite scenes, Jin & Sun have an emotional good-bye before Jin leaves. The boat sails away with everyone waving bye as we see the column of black smoke off in the background. 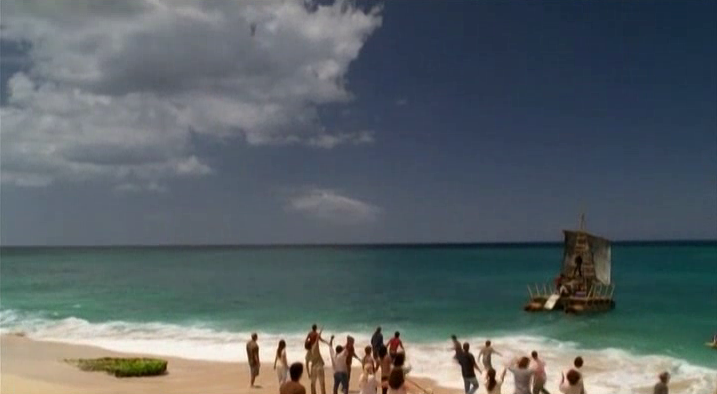 Sayid prepares everyone to leave the beach and head to the caves, while Jack & co. arrives at the Black Rock. As they ponder how the ship got to the middle of the jungle, Arzt thinks out loud that the ship probably got caught in a tsunami. Perceptive little bugger. Jack, Kate and Locke go into the ship to bring out a crate of dynamite, while Arzt and Hurley have a conversation about the presence of cliques. When they bring the dynamite out, Arzt shows them how to properly wrap the dynamite, leading to the hilarious and abrupt end to Dr. Arzt when he blows himself up. The episode runs 40:14 in is 331MB to download. You can stream below (via Facebook), or go here to use torrents (better quality, recommended) to download the episodes to your computer. I can't believe no one has commented on what an awesome episode ending that was. Dude. Heh, yeah, that one was pretty fun.